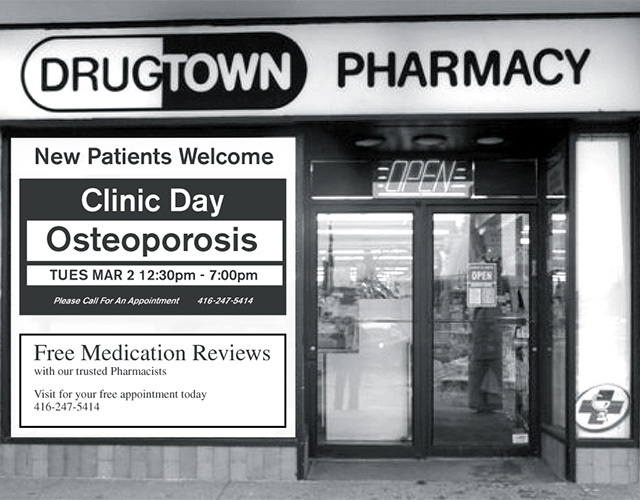 In an era of national chain drug stores, Drugtown Pharmacy has preserved the character and ongoing personal service of Etobicoke’s neighbourhood drug store for more than 50 years. From FREE MedsCheck consultations to FREE prescription pick-up and delivery, Drugtown offers you comprehensive professional pharmacy services along with one-stop shopping for over-the-counter medications, health and beauty aids, home health care, cosmetics, gifts, stationery and lottery tickets. Drugtown Pharmacy was founded in 1960 by Jack and Mollie Bloomberg. It is now under the joint ownership of long-time employees, pharmacists Chris Theis and Mila Gulan and store manager Michael Massarotto. Chris, Mila, Michael and their team are continuing to offer the same quality, personal service that Jack and Mollie established from the very first day that Drugtown opened its doors. The entire Drugtown team is here to talk to you, one-on-one, and answer any questions you may have or find any products that you need. Greeting Cards at 50% Off Every Day! Our Drugtown team is led by owner/pharmacists Chris Theis and Mila Gulan, owner/front-shop manager Michael Massarotto and Bathtique manager Anna Racco-Macchia. Our pharmacy and front-shop teams continue to practise the long tradition of fast, friendly and quality service that was established more than 50 years ago. We can help you in English, Italian, German, Serbian and Ukrainian.